In this tutorial, you configure a pipeline in AWS CodePipeline that continuously delivers your container applications using AWS resources that support Docker images. The completed pipeline detects changes to your image, which is stored in the Amazon ECR image repository, and uses CodeDeploy to route and deploy traffic to an Amazon ECS cluster and load balancer. CodeDeploy uses a listener to reroute traffic to the port of the updated container specified in the AppSpec file. The pipeline is also configured to use a CodeCommit source location where your Amazon ECS task definition is stored. In this tutorial, you configure each of these AWS resources and then create your pipeline with stages that contain actions for each resource. A Docker image file that specifies the container name and repository URI of your Amazon ECR image repository. An Amazon ECS task definition that lists your Docker image name, container name, Amazon ECS service name, and load balancer configuration. A CodeDeploy AppSpec file that specifies the name of the Amazon ECS task definition file, the name of the updated application's container, and the container port where CodeDeploy reroutes production traffic. It can also specify optional network configuration and Lambda functions you can run during deployment lifecycle event hooks. When you create or edit your pipeline and update or specify source artifacts for your deployment stage, make sure to point to the source artifacts with the latest name and version you want to use. After you set up your pipeline, as you make changes to your image or task definition, you might need to update your source artifact files in your repositories and then edit the deployment stage in your pipeline. Launch an Amazon EC2 Linux instance and install Docker to create an image as shown in this tutorial. If you already have an image you want to use, you can skip this prerequisite. Use the Amazon EC2 console to create an Application Load Balancer or a Network Load Balancer. The load balancer must use a VPC with two public subnets in different Availability Zones (the default VPC can be used). Configure one target group for your load balancer (with IP configuration). For instructions, see Target Groups for Your Network Load Balancers. In this section, you use Docker to create an image and then use the AWS CLI to create an Amazon ECR repository and push the image to the repository. If you already have an image you want to use, you can skip this step. Sign in to your Linux instance where you have Docker installed. Run docker images. You should see the image in the list.. 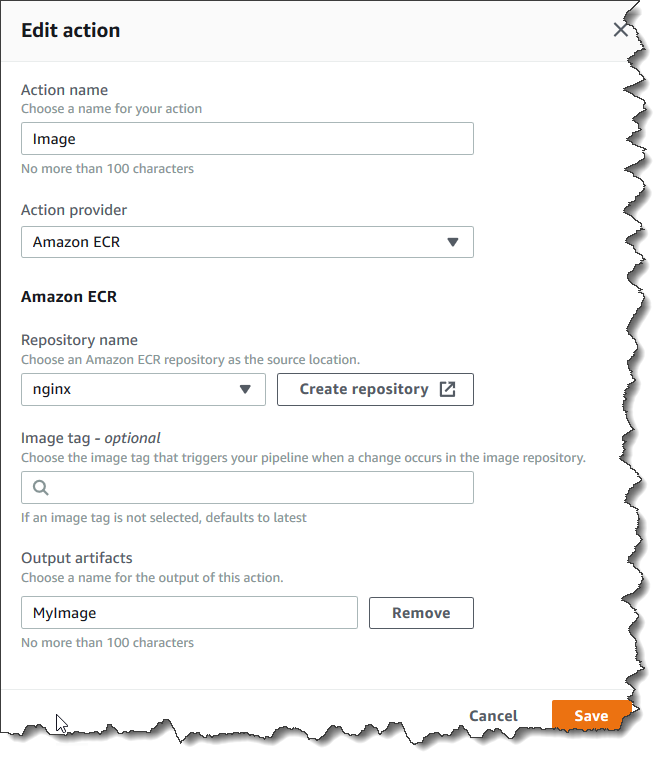 Create an Amazon ECR repository to store your image. Make a note of the repositoryUri in the output. Tag the image with the repositoryUri value from the previous step. Run the aws ecr get-login --no-include-email command in parentheses to get the docker login authentication command string for your registry. The authorization token command is run in memory (not exposed in the output) and completes the login. Push the image to Amazon ECR using the repositoryUri from the earlier step. In this section, you create a task definition JSON file and register it with Amazon ECS. You then create an AppSpec file for CodeDeploy and use your Git client to push the files to your CodeCommit repository. Create a file named taskdef.json with the following contents. For image, enter your image name, such as nginx. This value is updated when your pipeline runs. Make sure that the execution role specified in the task definition contains the AmazonECSTaskExecutionRolePolicy. For more information, see Amazon ECS Task Execution IAM Role. Register your task definition with the taskdef.json file. After the task definition is registered, edit your file to remove the image name and include the <IMAGE1_NAME> placeholder text in the image field. For more information about the AppSpec file, including examples, see CodeDeploy AppSpec File Reference. Create a file named appspec.yaml with the following contents. For TaskDefinition, do not change the <TASK_DEFINITION> placeholder text. This value is updated when your pipeline runs. git commit -m "Added task definition files"
In this section, you create an Amazon EC2 application load balancer. You use the subnet names and target group values you create with your load balancer later, when you create your Amazon ECS service. You can create an Application Load Balancer or a Network Load Balancer. The load balancer must use a VPC with two public subnets in different Availability Zones. In these steps, you confirm your default VPC, create a load balancer, and then create two target groups for your load balancer. For more information, see Target Groups for Your Network Load Balancers. Sign in to the AWS Management Console and open the Amazon VPC console at https://console.aws.amazon.com/vpc/. Verify the default VPC to use. In the navigation pane, choose Your VPCs. Note which VPC shows Yes in the Default VPC column. This is the default VPC. It contains default subnets for you to select. Choose Subnets. Choose two subnets that show Yes in the Default subnet column. Make a note of the subnet IDs. Choose the subnets, and then choose the Description tab. Verify that the subnets you want to use are in different Availability Zones. Choose the subnets, and then choose the Route Table tab. To verify that each subnet you want to use is a public subnet, confirm that a gateway row is included in the route table. Choose Application Load Balancer, and then choose Create. In Name, enter the name of your load balancer. In IP address type, choose ipv4. Under Load Balancer Protocol, choose HTTP. Under Load Balancer Port, enter 80. Under Load Balancer Protocol for the second listener, choose HTTP. Under Load Balancer Port, enter 8080. Under Availability Zones, in VPC, choose the default VPC. Next, choose the two default subnets you want to use. Choose Select an existing security group, and make a note of the security group ID. In Name, enter a target group name (for example, target-group-1). In Target type, choose IP. In Protocol choose HTTP. In Port, enter 80. Choose Next: Review, and then choose Create. After your load balancer is provisioned, open the Amazon EC2 console. In the navigation pane, choose Target Groups. In Name, enter a target group name (for example, target-group-2). In Protocol choose HTTP. In Port, enter 8080. In VPC, choose the default VPC. You must have two target groups created for your load balancer in order for your deployment to run. You only need to make a note of the ARN of your first target group. This ARN is used in the create-service JSON file in the next step. Open the Amazon EC2 console. In the navigation pane, choose Load Balancers. Choose your load balancer, and then choose the Listeners tab. Choose the listener with port 8080, and then choose Edit. Choose the pencil icon next to Forward to. Choose your second target group, and then choose the check mark. Choose Update to save the updates. In this section, you create an Amazon ECS cluster and service where CodeDeploy routes traffic during deployment (to an Amazon ECS cluster rather than EC2 instances). To create your Amazon ECS service, you must use the subnet names and target group value you created with your load balancer to create your service. Choose the Networking only cluster template that is powered by Fargate, and then choose Next step. Enter a cluster name and anything else on the Configure cluster page, and then choose Create. Use the AWS CLI to create your service in Amazon ECS. Create a JSON file and name it create-service.json. Paste the following into the JSON file. For the "taskDefinition" field, when you register a task definition in Amazon ECS, you give it a family. This is similar to a name for multiple versions of the task definition, specified with a revision number. In this example, use "ecs-demo:1" for the family and revision number in your file. You need to include your target group ARN in this file. Open the Amazon EC2 console and from the navigation pane, under LOAD BALANCING, choose Target Groups. Choose your first target group. Copy your ARN from the Description tab. This example creates a service named my-service. The output returns the description fields for your service. Run the describe-services command to verify that your service was created. Create a CodeDeploy application and deployment group. Open the CodeDeploy console and choose Create application. In Application name, enter the name you want to use. In Compute platform, choose Amazon ECS. On your application page's Deployment groups tab, choose Create deployment group. In Service role, choose a service role that grants CodeDeploy access to Amazon ECS. In Environment configuration, choose your Amazon ECS cluster name and service name. From Load balancers, choose the name of the load balancer that serves traffic to your Amazon ECS service. From Production listener port, choose the port and protocol for the listener that serves production traﬃc to your Amazon ECS service. From Target group 1 name and Target group 2 name, choose the target groups used to route traffic during your deployment. Make sure that these are the target groups you created for your load balancer. Choose Reroute traffic immediately to determine how long after a successful deployment to reroute traffic to your updated Amazon ECS task. A CodeCommit action where the source artifacts are the task definition and the AppSpec file. A source stage with an Amazon ECR source action where the source artifact is the image file. A deployment stage with an Amazon ECS deploy action where the deployment runs with a CodeDeploy application and deployment group. In Step 1: Choose pipeline settings, in Pipeline name, enter MyImagePipeline. Choose New service role to allow CodePipeline to create a new service role in IAM. In Role name, the role and policy name both default to this format: AWSCodePipelineServiceRole-region-pipeline_name. For example, this is the service role created for this tutorial: AWSCodePipelineServiceRole-eu-west-2-MyImagePipeline. In Deploy provider, choose Amazon ECS (Blue/Green). In Application name, enter or choose the application name from the list. In Deployment group, enter or choose the deployment group name from the list. Under Amazon ECS task definition, choose SourceArtifact. Under AWS CodeDeploy AppSpec file, choose SourceArtifact. At this point, do not fill in any information under Dynamically update task definition image. View your pipeline and add an Amazon ECR source action to your pipeline. Choose your pipeline. In the upper left, choose Edit. In the source stage, choose Edit stage. Add a parallel action by choosing + Add action next to your CodeCommit source action. In Action name, enter a name (for example, Image). In Action provider, choose Amazon ECR. In Output artifacts, choose the output artifact default (for example, MyImage) that contains the image name and repository URI information you want the next stage to use. Choose Edit on your Deploy stage and choose the icon to edit the Amazon ECS (Blue/Green) action. Scroll to the bottom of the pane. In Input artifacts, choose Add. Add the source artifact from your new Amazon ECR repository (for example, MyImage). In Task Definition, choose SourceArtifact, and then enter taskdef.json. In AWS CodeDeploy AppSpec File, choose SourceArtifact and enter appspec.yaml. In Dynamically update task definition image, in Input Artifact with Image URI, choose MyImage, and then enter the placeholder text that is used in the taskdef.json file: "IMAGE1_NAME". Choose Save. In the AWS CodePipeline pane, choose Save pipeline change, and then choose Save change. View your updated pipeline. Make a change to your image and then push the change to your Amazon ECR repository. This triggers your pipeline to run. Verify that your image source change is deployed.